The 'Ancient Vibration' Of Parlor Music, Revived By Two Generations A voice from a bygone era, Lena Hughes was never very famous outside of her native Missouri. The only album she ever recorded has been saved from near-oblivion, and it acts as a kind of time capsule. 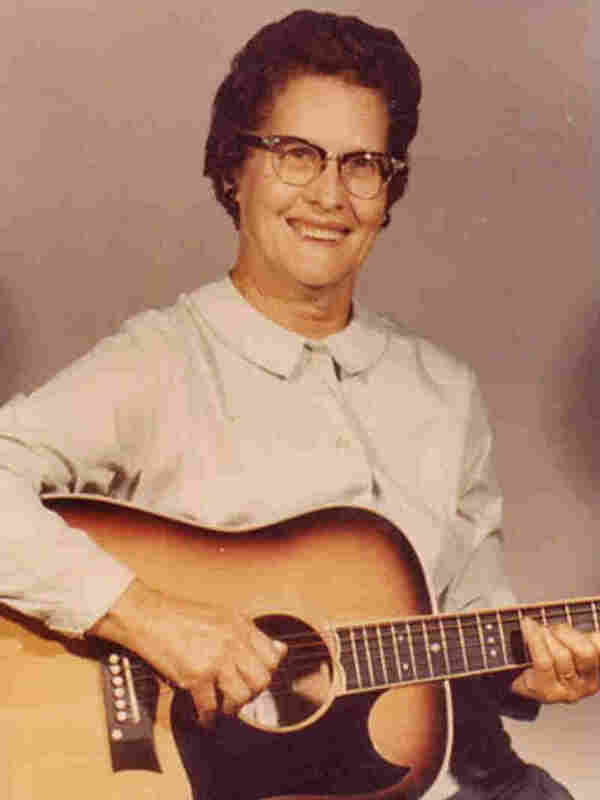 Lena Hughes recorded one album of Southern parlor music before her death in 1998. "It's quite simple, which always mystifies people," Marshall says. "How can it be so simple and sound so good? Well, I think there's a message in that. If you're a musician, sometimes you hear a tune that drills into the back, darkest part of your heart and stays there the rest of your life." Hughes was a master of parlor music — a style that was popular in the late 19th century, before the rise of recorded music. It was fashionable in those days for young women to play an instrument, and the guitar offered a cheaper alternative to the piano. Parlor music isn't a big seller these days, but for fans of the genre, those tunes that Hughes recorded in the 1960s are a treasure. "Musically, it was a real throwback," British guitarist John Renbourn says. "Very, very, very few people remembered that music — or still played — and she just plays it as I think it would've been, or as near as we're likely to ever hear somebody playing it." Renbourn is hugely influential, both for his work in the band Pentangle and as a solo artist. He says he remembers hearing Lena Hughes for the first time in the mid-1970s, when her version of "Pearly Dew" found its way onto a compilation of music from the American South. "A lot of people that were recorded in the folk revival did in fact play versions of those tunes, but not quite in the same pure way that she did," he says. Renbourn knew next to nothing about Hughes. He learned that she probably paid to record that LP herself and pressed only a few hundred copies, which she sold at fiddle festivals and other gigs. He tried for years to track down the record, but he never found one — until about six months ago. That's when he talked to record collector Christopher King, who had a copy that he'd found at a flea market in the mid-1990s. King, too, was a fan. "She's using these open tunings, and when she does a downstroke with her thumb, she fills out the room with this warm bass feeling," King says. "And then she plucks the melody. It's something haunting about the music that I think so many artists from the prewar generation were able to tap into, that for some reason, people nowadays can't." King arranged to have the LP reissued for the first time under the title Queen of the Flat-Top Guitar; Renbourn wrote the liner notes. On the cover of the album is a smiling, middle-aged woman wearing cat-eye glasses and a simple white blouse. She appears about as likely to teach Sunday school as to play at a local dance on Saturday night. But folklorist Howard Marshall says that picture doesn't tell the whole story. "She was just the epitome of the attractive young lady who broke into the hairy-legged men's world of fiddle playing," Marshall says. "Because she was so good and so charming, she just could not be stopped." As it turns out, Hughes was just as good on the fiddle and banjo as she was on the guitar. She was born in northern Missouri in 1904 and got her start playing at square dances with her brothers in the 1920s. She took first place in some regional country fiddling competitions in the 1960s. Marshall was working for the Smithsonian in the 1970s when he recorded Hughes playing and talking about her upbringing. "Well my miss sis and I, I was just 9 years old and we just started picking," Hughes tells Marshall on the tape. "She picked the guitar and I picked the banjo. My dad played the banjo just a little, and he showed us. So we just begin to pick out. And then I just, the more I picked, the more rhythm I put in it — picked my different ways." By the time Marshall made this recording, arthritis had mostly limited Hughes to playing the banjo. But he says she still knew how to throw a good house party. "When you knocked on the door, she swung the door open and almost shouted, 'Howdy, come on in.' And she'd give you a piece of pie and some of the world's strongest coffee," Marshall says. "And you'd be there all night, just playing music and talking and swapping stories. Really the worst coffee you've ever tasted. Nobody could really stand her coffee, but nobody could bear to mention it to her." Hughes continued performing into her ninth decade — often with her husband, Jake, who also played the banjo. The couple never had any children, but Marshall says Lena Hughes was adamant about passing her music on to future generations. "She was always saying, 'I really hope this music doesn't die out,' " Marshall says. "She would say that often when she got to be about age 90. I'd go pick her up, and we'd go play at a dance near where she lived. And she'd keep — all the way over there and back — she'd say, 'I hope somebody will keep this music going.' "
In the end, it's Hughes herself who's keeping parlor music alive, with a little help from some fans she never met.